Whether you’re moving to a new home or planning a cross-country trip, a professional motorcycle transporter can make life easier and save a classic bike from thousands of miles of wear. Motorcycle owners on vacation often pay for hauling services on one leg of a longer trip— to a big run like Sturgis, for example— then ride back. Whatever the occasion, if you’re hiring someone to haul your baby, it’s important to find the best possible transporter. 1. Know the type of trailer you need to protect your motorcycle. If you’re sending your bike to Timbuktu, you need to consider the duration of the journey, the weather conditions along the way, and how they might affect your bike. If you’ve invested a significant amount of time, energy, love or cash in a motorcycle, you should consider hiring a transporter with an enclosed trailer. Quotes for enclosed trailer transport might run a bit higher, but your cargo won’t be exposed to the elements. 2. Search for verified, unedited reviews of transporters. Once you’ve determined how your bike should be transported, look for reviews online. uShip, the Better Business Bureau and Google are all excellent resources for locating feedback from past customers about any business. It’s easy to tell when reviews come from actual customers, particularly on sites like uShip where verified customers are encouraged to leave feedback. 3. Confirm the operating authority and insurance coverage of the transporter. If your transporter is crossing state lines with your motorcycle, ask to verify their operating authority, which usually consists of a federally provisioned MC (Motor Carrier) number and DOT number. You should also ask for proof of your hauler’s cargo insurance in writing, which they should readily provide. Your personal motorcycle insurance will likely not cover any damage incurred in transit, so cargo insurance is essential. 4. Ask for the terms of payment upfront, before accepting a quote. 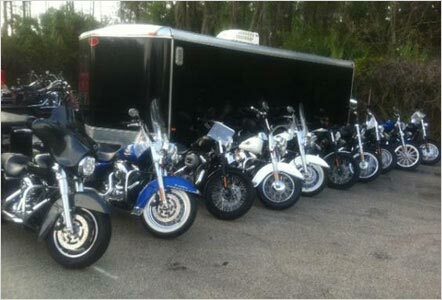 In working with a professional motorcycle carrier, you should know right away when and how payment will take place. The method of payment should be easily understood. That said, this step makes it easy to identify potential fraudsters: if a company requests cash payment via wire transfer, take your business elsewhere. Pro transporters might request a deposit, followed by the remainder upon delivery. On uShip, however, your credit card will be charged upfront, and the transporter won’t receive your payment until you release it upon delivery. Keep in mind that in all scenarios, carriers can legally refuse to unload your motorcycle until you’ve paid in full (or electronically ‘released payment’). 5. Be flexible on the timing of pickup and delivery. Since the safety of your motorcycle and its transporter are the number one priority, determine a reasonable timetable for delivery ahead of time. Last we checked, motorcycles can’t be teleported, so look out for companies that claim to make a coast-to-coast journey in a few days flat. Once you’ve found a quality, well-reviewed transporter, work with them to establish a flexible schedule for pickup and delivery – it’ll also help to lower your quote. Also, I've found that almost any given motorcycle accident lawyer will have good advice on this kind of thing. Apparently, they just get that much business.